Winter ~ Friday through Monday for dinner. Friday through Sunday for lunch. The Garnet Hill Lodge and Cross Country Ski Center is hidden away three miles southwest (and uphill) of Route 28, near Thirteenth Lake on the edge of the Siamese Ponds Wilderness area. The access road is located between North Creek and Indian Lake. 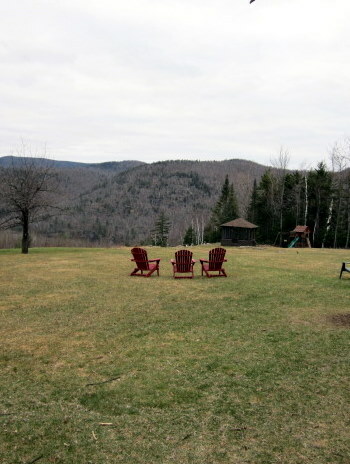 It is as picturesque a location as the Adirondacks has to offer, with mountain vistas and a sweeping lawn, complete with requisite Adirondack chairs overlooking the lake. Its storied past goes back to 1936 but the lodge looks even older. It has the look and feel of the Great Camps of yesteryear, complete with massive stone fireplace, log beam ceilings and one of the prettiest dining rooms in the Adirondacks. And my new favorite bar. The new owners, town of Johnsburg locals Don Preuninger and Mindy Piper, rescued this North Country jewel at auction last fall, and have begun their mission of reclaiming the inn’s former glory. In addition to the restaurant and pub the lodge offers accommodations with canoeing and kayaking on Thirteenth Lake, numerous trails for cross country skiing and snowshoeing in winter, and hiking and biking in summer (or winters like last winter). Executive Chef Andrew Bulmer, who worked here in the 1990’s, was recruited to return and run the kitchen. Long time pastry chef Mary Jane Freebern has been baking her famous pies and breads at Garnet Hill for almost forty years. Behind the bar I spied Jeff Goodspeed, whose acquaintance we had made twenty years ago at the wonderful Chestertown restaurant, Rene’s Mountain View, now long shuttered. Along with the experienced staff, the new owners bring a new vision to the operation. They have significantly up-scaled the dining experience, while retaining the relaxed “ski lodge” atmosphere. The results so far are most impressive. On site vegetable and herb gardens are planned for this summer. It has only been a few months but Mindy’s decorative touches in the dining rooms are already evident. The regular menu focuses on traditional fare like chicken cacciatore ($13.95) served with a choice of house made soup or mixed green garden salad. There is a Muscovy duck breast on the current menu, pan seared with a clover honeyed brandy sauce ($17.95). The kitchen will prepare a rainbow trout three different ways ($14.95) – charbroiled with a parsley almond pesto, oven baked with rosemary and mushrooms, or my favorite ~ a la meuniere, dredged in flour and simply sauteed with spritz of lemon and flakes of fresh parsley. Last night we stopped in for a special “Wine Dinner”, which the owners plan on offering on a regular basis. The MC for the evening’s festivities was Rick Annis of Martin Scott Wines, a small distributor which focuses on the wines of smaller producers. For the princely sum of $55, diners were offered five courses with five wines – including a cheese course with port. Only in the North Country (in March) can you find these types of deals. I won’t walk you through the whole evening’s menu but I’ll tease you with the appetizer(s). A trio of grilled sausages was plated with dressed mixed greens – slices of venison blueberry sausage, smoked bison laced with Burgundy, and duck sausage spiked with Triple Sec. Diners could choose one of three wines to have with this first dish – Big Vine Arroyo Grande Pinot Noir from California’s Central Coast, a Finca Decero Malbec from Remolina Vineyard in Argentina, or – my selection – a Marchese Di Gresy Barbera D’Asti from Piedmont. Remember we are being offered all of this as part of the $55 special, and we have two entree courses yet to arrive, one of which was filet mignon topped with foie gras and shavings of black truffle. The lodge’s lawn overlooks the lake. To complete this picture I’ll end our journey with the last course, a communal platter of sliced cheeses is brought to the table with a glass of Ruby Port from Quinta do Noval. The owners moved to a piano in a corner of the lodge’s dining room. Mindy was convinced to sing with Don, a classically trained pianist (who will be performing at the Tannery Pond Community Center next month.) My only regret was that we had not planned ahead and booked a room for the night. As we got up to leave we said good night to Don and Mindy and thanked them for a wonderful evening, and also to tell them what they already knew – what a truly special place this is. 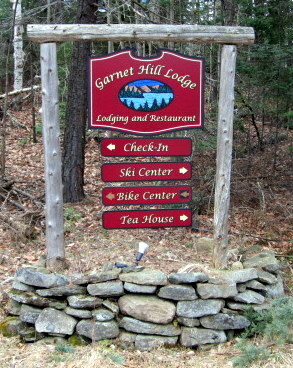 Welcome back Garnet Hill Lodge! You should go there soon … and say thank you to Don and Mindy for saving it. Thank you Don and Mindy for saving the Lodge.